We’re happy to announce two New Milford downloads! A few months ago we announced that we had discontinued our “New Milford: 230 Years” CD-ROM. Now, we’re happy to say that we’ve followed through on our commitment to bring you the important material from that CD in the form of downloadable files. You benefit because (1) it’s less expensive for us to deliver material to you by downloads than by making and shipping CDs — so we pass the savings along to you, and (2) you get the material you want immediately (or as fast as the file can download) without waiting for us to pack and ship the CD and the Post Office to deliver it to you. Both of these include indexes we prepared especially for them, and both are in PDF format — readable on your computer, whether a PC or Mac. While the CD-ROM cost $20 plus postage, these downloads are available for $5 for the Two Centuries book, and $4 for the 1937 yearbook. Take a look at the New Milford page of our website for more information! Or, have a look at our catalog! We’ve just published another high school yearbook — this one nearly a century old — so we thought we ought to comment on this particular one. High school yearbooks capture moments in time – or at least the best of them do. This one, soft cover and limited size included, give us a glimpse of this Jefferson County community at the beginning of the Roaring Twenties – an era which would change American culture in significant ways. It also represents a time when there seemed to not yet be a consensus about exactly what belonged in a high school yearbook, as the contents of this number illustrates. First, the graduates that year numbered seven. That’s not exactly a large graduating class. So, absent was the customary bunch of pages of portraits and accomplishments. A single photo suffices for the class. There is a senior class history. A senior class will. A senior class prophecy and a class poem. An address by the class president, followed by a response by a member of the junior class. Then follows a series of essays: “The United States Merchant Marine” “The Grand Canyon of Arizona” “A Drama” (about Shakespeare’s Macbeth) “Helen Hunt Jackson” (identified as one of the most famous women in the United States; unknown today, she seems to have been an advocate for Native Americans). Remarks by the Principal at the presentation of diplomas are followed by an article advocating for a new high school. Then comes a curious table called “School Census, 1921-1922 – Incomplete Returns” which we presume was humorous. With prohibition in effect, next comes the obligatory article “Alcohol as a Menace”, followed by a light-hearted section called “Ifs” and a “Who’s Who”. A photo of the baseball team is followed by a history of the school, which is in turn followed by reports on the various sports teams. Then comes a real oddity: the constitution and by-laws of the Ontario Interscholastic Baseball League. (we are still scratching our collective heads over that one!). Then some current poetry – again, presumably humorous if you knew the individuals mentioned. Some more humor is punctuated by a photo of the girls’ basketball team. Rather abruptly a photo of the Adams Center High School faculty appears, along with the list of the members of the board of education. A boon here for family historians, next to come is a list of alumni by class, including their present city of residence. Class years begin with 1899, and the compilation is acknowledged to be incomplete. Then comes a list of the members of each class of the high school – including two post grads – and a list by class of those in the elementary school. Ten pages of advertisements wrap up the book. Yes, we do have it for sale as a download. If you’re sold on this one, go right to it on our Jefferson County, NY page. But we have republished quite a number of yearbooks now, so if you would like to see them all listed in one place, you can go directly to our yearbook page. Suffield history and genealogy took a step forward this week, as we re-published some documents that should be genuinely helpful. 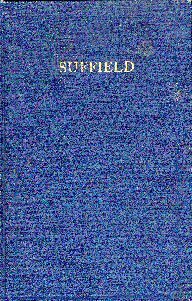 Suffield Quarter Millennial — this book encompasses the history of Suffield, CT from its founding until the time of the celebration, is also the program for the celebration, and has tons of additional Suffield information in it. A package of miscellany, including an article from the first volume of the Connecticut Quarterly, a short excerpt from the Connecticut Guide, and a lot of photos. You can find all this Suffield history and genealogy on our Suffield page on our main website. If Suffield, CT is of interest to you, have a look today! 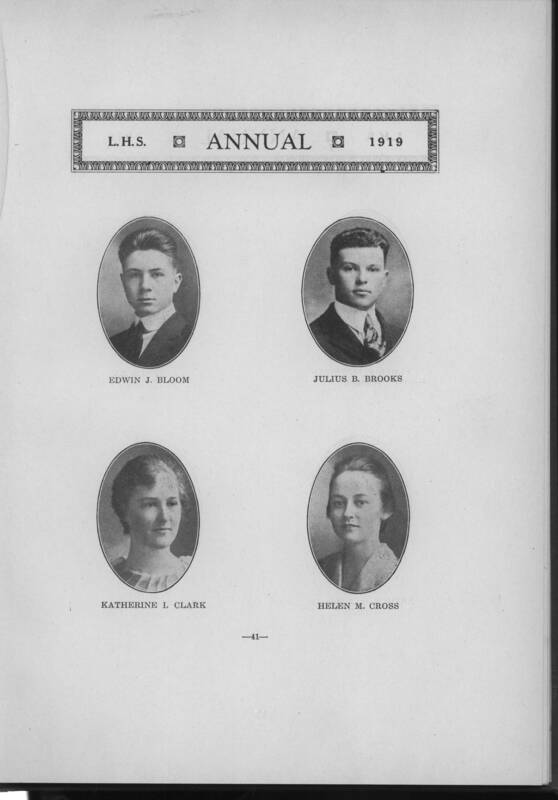 The Liberty High School Annual for 1919 was the first-ever yearbook Liberty High School published. High school yearbooks are one form of history within which everyone is recorded when they graduate from high school. They, and their community, are frozen at a point in time that the yearbook captures and keeps. Haircuts, clothes, friends, teachers, the sense of humor of the era, the area businesses – they are all captured as they were, not as we choose to remember them or tell our children they were back in the good old days. 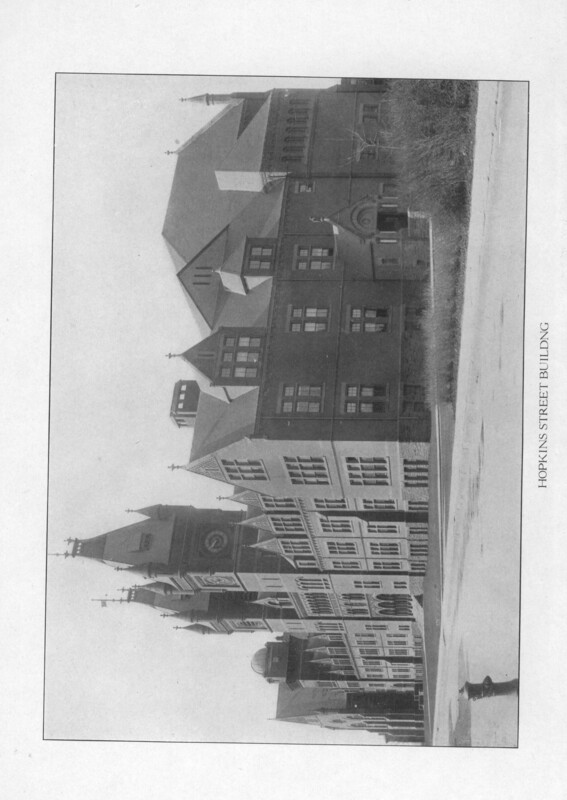 The class of 1919 graduated before a period of major social change, as a cursory examination of the yearbook will demonstrate. First off, the size of the class demonstrated the extent to which completion of a high school education was not a general expectation. In a community that had not changed that much in size between 1919 and the later, post WWII yearbooks we republish, this graduating class is tiny. Viewing the credentials of the faculty, it’s clear that the expectation that a high school teacher would have even a baccalaureate degree is a creature of the near-century that elapsed since this class graduated. The function of the yearbook has also changed, quite clearly. 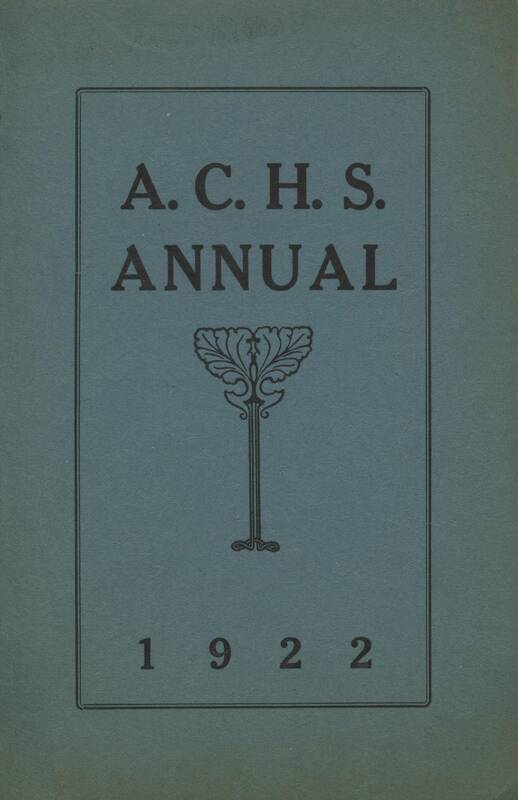 More recent yearbooks are almost entirely about the class graduating, and on the activities in which they were participants. This issue turns the focus back to those who went to Liberty High School in previous years, even decades. From our point of view today, capturing this much news about Liberty High School alumni dating back into the previous century (the first class with alumni reporting was the class of 1893) is a book for those searching for a larger population than a single year’s graduating class. 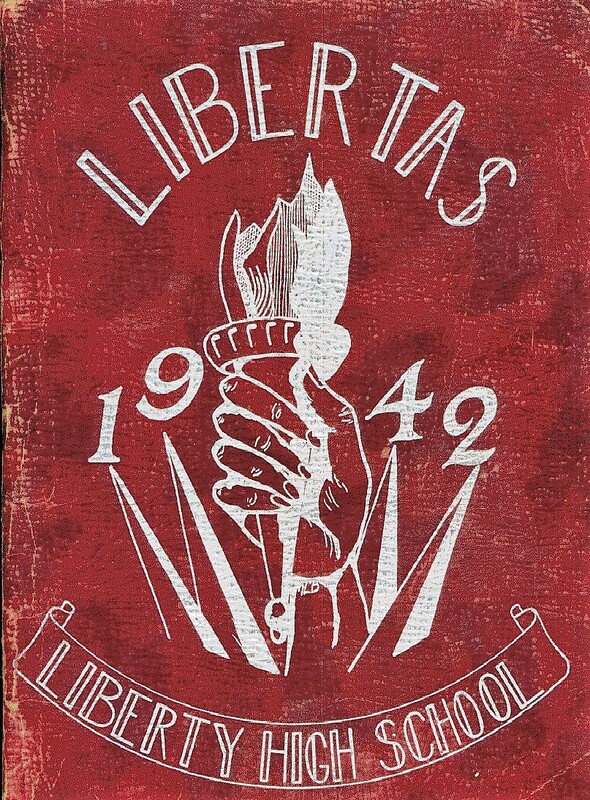 You’ll not be surprised that we’re offering the Liberty High School Annual for 1919 as a download. Interested? CLICK HERE to see it on our main website. 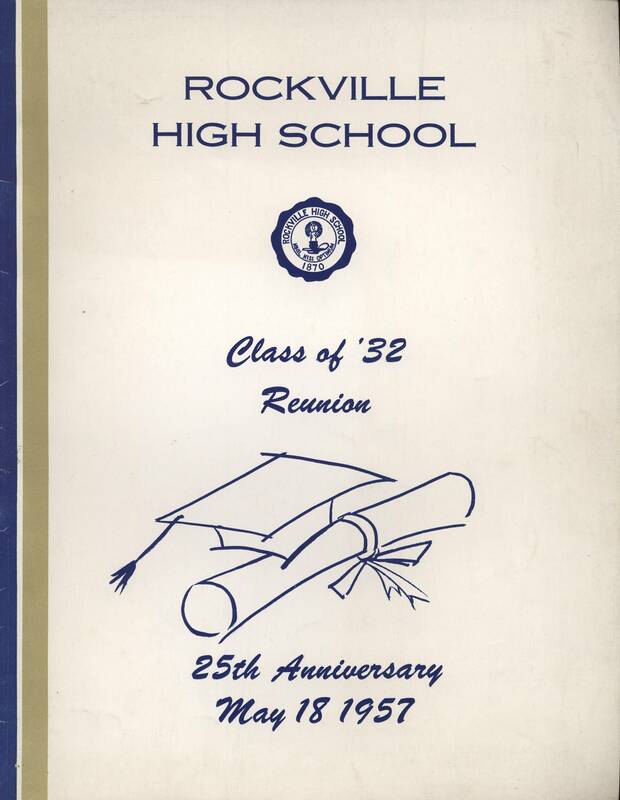 A few years ago we republished the high school yearbook of the class of 1932 from Rockville High School in Connecticut. Now we are happy to offer a rare chance to be able to look back on these students a quarter century (and one great depression and two wars) later with their 25th reunion program. More information about this program, now available as a download, is on the Tolland County page of our main website. This is one of the oldest high school yearbooks we’ve republished, and also one of the best. High school yearbooks were different animals, back before the roaring 20s — indeed, high schools were! Not everyone went to high school, just for openers. Hartford, Connecticut, was also a different city. Hartford was prosperous then. This was a time when the city (and probably the state) were governed by the “Seven Bishops” — the Episcopal Bishop of Connecticut, and the CEOs of the six major insurance companies headquartered there that made Hartford the Insurance Capital of America. This is a remarkable social document, and it is available now as a download now, for $5.00. See it on our main website HERE.